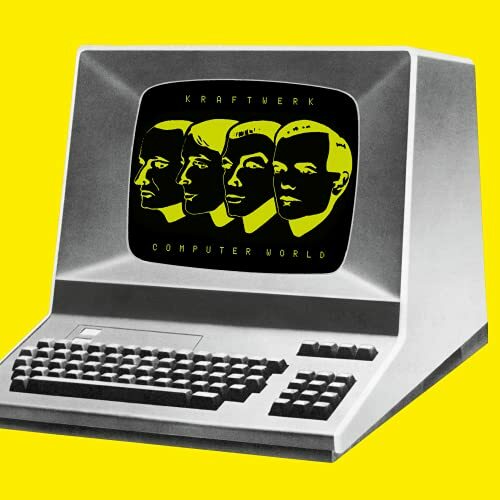 What computer is on the cover of Kraftwerk's Computer World album? or a wang 2200... but my bet would be on a stylized version as well. I always thought it was a VT-100 but comparing the two shows it's similar, but not quite. Regarding the original record, anybody know of somewhere online with scans of the LP's picture sleeve? Although there's a bonus track, those photos weren't part of my Japanese-import CD's packaging. That would be the Hazeltine 1500 which was just a cursor-addressable ASCII terminal, not a computer of any kind. Closest match visually and time-wise. Here's a clearer shot of the Hazeltine that better shows off the similarities. just a terminal too, i always thought.